The great Doctor Andrianna Alexandropouloucame to our Center in order to carry out our annual spring sterilization program. Many of our island strays were spayed and neutered as well as many of the animals owned by members of our island community and examinations and vaccines were provided as well. The cats came from all the villages of Amorgos—the areas of Katapola, Kastelopetra, Chora, Saint George Valsamitis, Kato Meria and Aegiali. Doctor Alexandropoulou was sent to us by the Amorgosvia Aegean Cats along with Doctor Manolis Vorissis and together they have begun a vital program for the care of the enormous stray population in these Cyclades Islands. We would like to thank the Municipality of Amorgos who covered the expenses for the medical supplies as well as the salary of the vet and host the vet during this time. We thank also the Vice Mayor Mrs Anna Gavala for their continued help in our project. We also want to thank all of our donors who help us continue this most important work and of course our amazing volunteers Hariklia, Mata, Anna, Giorgos, Evangelia, Iannis and Angeliki as well as the local residents for their important help. We have renewed our appointment for the autumn!!! Thank you, once again, Andrianna, Manolis and Aegean Cats—we live together with love and generosity. 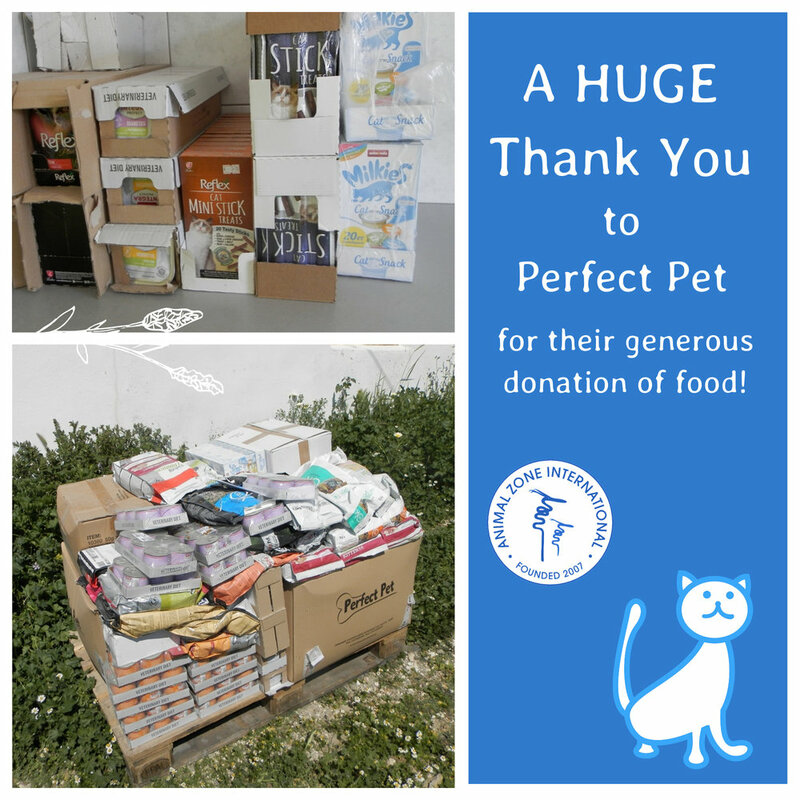 We want to warmly thank Perfect Pet (http://www.perfectpet.gr/) for their donation of cat food. Perfect Pet responded directly to our request for cat food by sending us a large quantity of food that fulfills our immediate needs to feed hungry stray cats. During this difficult time in Greece, one of the main challenges faced by animal welfare associations like ours is supporting and feeding the huge number of stray cats under our care. The tremendous generosity of Perfect Pet is an example to be imitated! From all of us in New York and Amorgos, a huge thanks to Perfect Pet!!! In mid January, Sara came to our Center with a serious respiratory infection as well as with a number of other problems. This small kitten had been living in the garden of a kind woman who tried to help her but when the problems grew too serious she came to us for help Sara. For twenty one days we cared for Sara and treated her many problems. Now, She is a playful kitten and has gained enough weight to go back to her garden where she will be cared for with kindness. We have donated a special food for kittens (Royal Canin Kitten) and we hope and pray that Sara will remain healthy and grow strong so that she will be able to survive the hard winter seasons that are so difficult for our island cats and kittens. If you see a sick or injured cat on Amorgos, please don’t let it suffer. Call us and we will come to its aid. Animal Zone International is committed to helping animals in need on Amorgos. Recently, we were confronted with a tragic situation. In Langada, one of our volunteers found an extremely ill cat who was suffering very badly. His mouth and surrounding area was completely deteriorated and he was actively bleeding from its mouth. The pictures are too terrible to publish. By the time the cat was brought to us, it was too late to help him, and the only humane solution was euthanasia. Sadly, we can only assume that he was in this appalling condition for many days, and yet no one took steps to help the poor creature. In the future, we implore all passersby not to ignore the suffering of an animal and to call us so that we can give treatment earlier, possibly saving it from suffering and death. Our clinic is located in the area of Katapola, and we are readily available for animals in need. When we can, we will come to you but sometimes we may ask your help to bring the animal to our center if a car is not available. In 2010, Animal Zone International was first moved to rescue equines when members of PMAA, the local animal association, reported the tragic existence of a neglected mare, donkey and mule. These animals were abandoned, castaway as unfit for work, in the middle of nowhere, with no food, no water, and with their legs tied together to restrict their movement. To house these rescued equines, AZI financed the construction of a stable on the land offered by the Municipality of Amorgos. Since that time, AZI has sheltered many equines in need. After nine years of constant use, the stable and shelter in general are in great need of renovation. More urgently, one week ago strong winds blew off part of the roof of the stable, with the result that our animals (1 horse, 1 mule, and 2 donkeys) are now left without proper shelter. As it is still winter on the island and the weather is very cold and rainy, it is critical for the roof to be repaired quickly. We are asking for the help of animal lovers everywhere to pitch in to raise emergency funds for this. If we each give a small amount, we will have enough to rebuild the stable. Let's work together! These equines deserve a sturdy shelter against the cold winter weather. Our goal is $1,701 (1.500,00 euro). With your generous help we can make it happen! The members of Animal Zone International would like to express their deep sorrow at the death of Sofoklis Prekas, and we offer our sincerest condolences to his family. Sofoklis Prekas was a great man, kind and generous, and always ready to offer his help to those in need. He was a long-time supporter of AZI and, when we were in need of a site for our clinic, he gave us space in his own building without asking for payment. Later, as we grew and needed even more space for the storage of food for our rescued animals, he gave us another room without charge. Sofoklis Prekas was good-natured and always willing to reach out to those around him. So many of our lives have been enriched by this loving man, not least among us his friends in the animal kingdom. You will be missed dear Sofoklis and we join your family in paying our deepest, deepest respects. It's been two years since Petra and Pinelopi were adopted! Back then they were two small kittens; now they have become gorgeous, healthy cats. Petra and Pinelopi were adopted as a pair by the owner of an orchard near to our Center. Together they enjoy freedom and being out in nature and live well in the big orchard they call home. Now a sweet beauty, Bella came to our Center on 1st of November when she was only 2 months old. She was a tiny, sick kitten full of skin problems. Now she's become a healthy, plump, beautiful kitten. Please donate NOW to help us continue her care! And, in due time, she will be available for adoption. Won't you welcome this gorgeous little beauty into your home? Dear Friends, Happy Holidays! We're thrilled to share a short video of AZI's work and actions from this year. Take a look and let us know what you think! The great Dr. Vorisis came to our center to help in the sterilization program that we have begun. Many strays were spayed and neutered but he also saw many of the animals owned by members of our island community who were in need of examinations and vaccines. Among those animals who came to us was a pregnant goat with a deep wound in her chest which Dr. Vorisis cleaned and planned to suture, but, before he could perform the surgery, this sweet goat gave birth to two handsome healthy boys. After the birth the doctor repaired the wound and the goat and her babies were returned to their home, where, we hear, they are doing beautifully well. Thank you, once again, Dr. Vorisis! Our beautiful white mule Meropi is no longer with us. Meropi came to our equine shelter five years ago once her legs were no longer able to support the heavy loads that she had been carrying through her long life, as well as due to the damage of the hobbling that she endured once those loads were delivered. After Meropi was freed of these burdens her condition improved and she lived through her last years in our shelter surrounded by peace and loving care. But time moved on and the long years of hard work took their toll on her damaged limbs. The diagnosis for Meropi was not good, her suffering was great, and, because she was no longer able to stand, we at the Center, along with our veterinarian, felt that the act of greatest kindness would be to send our dear thirty-year-old Meropi to sleep. She was the sweetest of mules and her strong character had made her the head of the herd at our Center. We will all miss her but we are thankful that, with the help of so many of our supporters, we were able to give Meropi these last beautiful years of freedom and joy. Animal Zone International, in cooperation with the Municipality of Amorgos, will be conducting a sterilization program for stray cats on Friday 9 and Saturday 10 of November 2018. The cost of the program will be covered by Animal Zone International and the Municipality of Amorgos. Owners who do not wish their cats to be sterilized are kindly requested to keep them in their home on the two days when the program is being conducted or to place a collar around their necks so that our volunteers will not catch them. As a reminder, according to Law 4039/2012, Article 5, Item g: The owner of the dominant pet is obliged to take care of its sterilization if he does not wish to keep the newborn animals or can not dispose them to new owners. He is also required to ensure the microchip and the recording of his animal as well as to issue a health booklet, but also to place a metallic badge on the collar of the animal, which is provided annually by the veterinarians during the annual rabies vaccination. Donate now—click on the yellow bottom at the top of the page. Your donation goes toward many programs that AZI sponsors, including feeding hungry cats, vaccinations, as well as the spay/neuter program. Thank you for your support! Celine arrived at our Center at the end of August, a tiny two-month old baby in dire condition and now, after treatment for parasites and good healthy high-quality nutrition, Celine has become a beautiful, shinny and chubby kitten who never stops playing. Celine is available for adoption and she will be a grateful and affectionate member of her new family.